How you use it is, of course, up to you, but each of the functions in the PocketDock Line Out Mini USB test unit SendStation sent me saw plenty of action. The most obvious port the adapter adds is a line-level audio output for getting decent quality off the iPod and onto any music center. 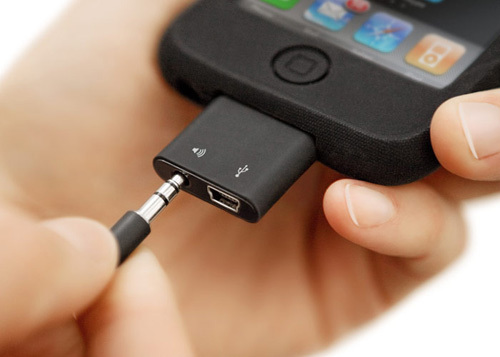 Ideally, one with a USB socket for grabbing a charge at the same time. There’s a choice of two cables in the package - 3.5mm jack to the same at the other end or 3.5mm to mini RCA plugs - allowing hookups with most any kind of music system. I had no arguments with the audio quality and definitely found it clearer than output from the normal iPod headphone socket. Plus, SendStation says using the line-out draws less power as well. Which is nice. Moving on, a mini USB port sits beside the line-out, thereby freeing us from the tyranny of the Apple dock connector. Instead, ‘pods and ‘phones can juice up or sync using a standard mini USB cable of the sort that comes with cameras and the like. I already carry one around attached to my E-Mobile HSDPA modem, so it’s sayonara to the dock connector cable I generally pack beside it for those ‘Oh look - it’s just gone 3pm and the iPhone’s dead again’ moments.